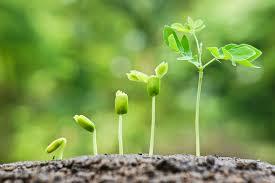 In the Growth in Plants unit we will learn how plants grow and develop from meristematic tissue. You will also learn how plant hormones such as auxins can affect this tissue by influencing gene expression. Last we will look at how the meristem of plants can be manipulated to grow whole plants in a technique known as micropropagation. ​Plants adapt their growth to environmental conditions. 9.3 U 1​ Undifferentiated cells in the meristems of plants allow indeterminate growth. Define indeterminate growth and totipotent. State that most plants have indeterminate growth and have totipotent cells. Many plant cells, even fully differentiated types, can generate whole new plants containing cells that are totipotent. This characteristic sets plants apart from most animals. Meristems are areas where growth occurs and are composed of undifferentiated cells undergoing active cell division. Apical meristems are at the tips of the roots and stems. They are responsible for primary growth of the plant. Lateral meristems are responsible for secondary growth (increasing the diameter and thickness of the plant). Dicot plants have apical (primary growth) and lateral (secondary growth) meristems. of the stem and development of leaves. Outline role of mitosis in the growth of stem and leaves while maintaining a meristem. Cells in the meristems undergo mitosis repeatedly to produce new cells and growth in a plant. Root meristems are responsible for growth and extension of the root. Shoot meristems creates cells responsible for shoot growth, but also create cells that will develop into flowers and leaves. Apical meristems create additional meristems including protoderm (forms epidermis), procambium (forms vascular tissue) and ground meristem (forms pith). State the generic function of plant hormones. Outline how auxin concentrations regulate plant growth in the root and stem. Outline the role of auxin in apical dominance. 9.3 U 4 ​Plant shoots respond to the environment by tropisms. State two external factors that control the growth of roots and stems. Define tropism, phototropism and gravitropism. A tropism is growth or movement towards or away from an external stimulus, such as light, gravity or chemicals. Phototropism is growth towards or away from an external light source. Generally in plants, shoots grow towards the light (positive phototropism) and roots grow away from the light (negative phototropism). Phototropism is essential for plants to make sure they grow towards the sunlight. 9.3 U 5 ​Auxin efflux pumps can set up concentration gradients of auxin in plant tissue. Outline how PIN-transport proteins can direct direction of auxin flow. Explain how auxin concentrations allow for phototropism in the stem. Explain how auxin concentrations allow for gravitropism in the root. If the amount of sunlight is greater on one side of the plant, the phototropins trigger reactions that will cause the redistribution of auxin by efflux pumps to the dark side of the plant. High concentrations of auxins cause cells on the shaded side of the cell to swell and elongate. When auxin binds to a receptor in the nucleus , this activates a proton pump. The proton pump moves H+ ions into spaces in the cell wall, decreasing the pH. This results in the breaking of the hydrogen bonds between cellulose fibres, resulting in the swelling and elongation of these cells. As the cells elongate and swell on one side of the plant the stem starts to curve towards the light source because of this uneven growth. The plant now is growing towards the light source (phototropism). 9.3 U 6 ​Auxin influences cell growth rates by changing the pattern of gene expression. Auxin is a plant hormone and influences cell growth rates by changing the pattern of gene expression with a plant’s cells. Auxin’s mechanism of action is different in shoots and roots as different gene pathways are activated in each tissue. Auxin moved to side of stem with least light/darker side causing cells on dark side to elongate/cells on dark side grow faster. The gene expression is altered by auxin to promote cell growth. 9.3 A 1 ​Micropropagation of plants using tissue from the shoot apex, nutrient agar gels and growth hormones. Outline how changing auxin and cytokinin ratios can lead to development of roots or shoots from the same explant tissue. 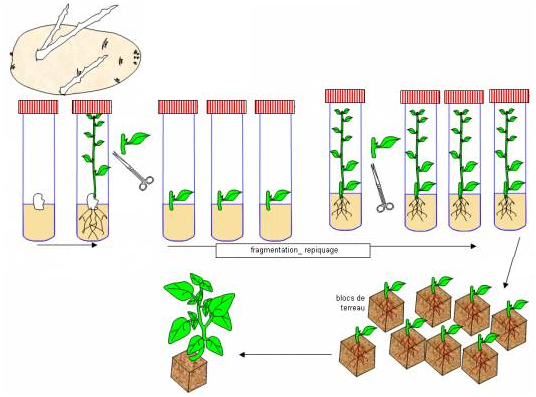 Micropropagation is a rapid multiplication of a selected plant using in vitro culture techniques.The propagation of selected plant through micropropagation would be useful for raising plantation using apical and nodal segment. They are best for micropropagation and mostly result in true to type plants. These segments upon the subsequent subcultures result in a number of multiple shoots. These multiple shoots on elongation allowed to root in vitro. After rooting, they are in vitro hardened and transferred to field. In embryo culture, the embryo is excised and placed into a culture medium with proper nutrient in aseptic condition. In protoplast culture, the plant cell can be isolated with the help of wall degrading enzymes and growth in a suitable culture medium in a controlled condition for regeneration of plantlets. 9.3 A 2 ​Use of micropropagation for rapid bulking up of new varieties, production of virus-free strains of existing varieties and propagation of orchids and other rare species. Micropropagation can be used to produce disease-free plants. It can have an extraordinarily high fecundity rate, producing thousands of propagules while conventional techniques might only produce a fraction of this number. It is the only viable method of regenerating genetically modified cells or cells after protoplast fusion. It is useful in multiplying plants which produce seeds in uneconomical amounts, or when plants are sterile and do not produce viable seeds or when seed cannot be stored (see recalcitrant seeds). Micropropagation often produces more robust plants, leading to accelerated growth compared to similar plants produced by conventional methods - like seeds or cuttings. Some plants with very small seeds, including most orchids, are most reliably grown from seed in sterile culture. A greater number of plants can be produced per square meter and the propagules can be stored longer and in a smaller area. Plants communicate chemically both internally and externally. To what extent can plants be said to have language? Plant hormones, also known as plant growth factors, are chemical substances that accelerate, inhibit or otherwise affect growth. This animation looks at how the action of indole-3-acetic acid (IAA), the most common form of auxin, works and how we discovered what auxins do. Paul Andersen explains how plants use hormones to respond to their environment. The following hormones are detailed; auxin, cytokinins, gibberelins, abscisic acid and ethylene. Plants respond to a light which is called phototropism.